The province of BC estimates it loses 200 Million Dollars each year in lost tax revenue due to the sale of illegal tobacco. 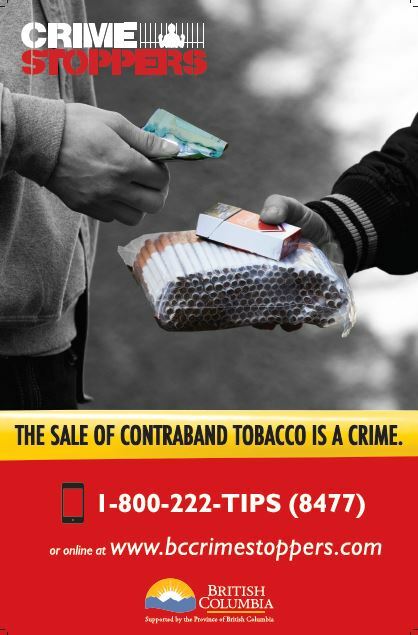 Proceeds from the sale of tobacco can be linked directly to organized crime, which funds their criminal activities, which makes our communities unsafe. Do you know what you are smoking? Foreign substances such as rodent feces, insects and mould have been found in these cigarettes, as there is zero quality control when they are manufactured. Help stop the funding of Organized Crime and make your community a safer place to live. If you are an ordinary person with no super free groceries privilege ... Which by the way we are pretty certain doesn't exist...and you know the pair.... and you are fed up because they didn't invite you for dinner..... then tell us! You will remain anonymous so future invites remain safe! If your tip is successful then you could earn a cash reward, which you can use on groceries, so it would kinda be like they are free! Greater Victoria Crime Stoppers shared a post. If you see Teci please contact Victoria Police and let them know where she is. Their number is 250 995 7654.Have You Seen Teci London? VicPD officers are asking for your help as we work to locate missing person Teci London. Teci is a 41-year-old Caucasian woman standing five feet, eight inches tall and weighing 155 pounds. She has brown hair and green eyes. Teci was last seen in Esquimalt around 8:30 p.m. on Tuesday, April 16. Police and Teci’s family are concerned for her well-being. Teci may be driving a newer model black 2-door Jeep Wrangler. West Shore RCMP are looking for help in identifying the people in the photo’s shown. © 2019 Greater Victoria Crime Stoppers.